My Funfetti Candy Birthday Cake makes your birthday boy or girl so happy!! Topped with candy favorites, it’s sure to bring a smile to all! I made this little individual Funfetti Candy Birthday Cake for some of my boys friends and it turned out so cute I just have to share it with you. It was so easy to put together, trust me I am no cake decorator! You’ll need some 4-6 inch cake pans and the rest is easy! 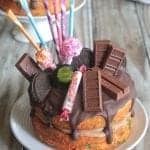 This recipe really is the perfect birthday cake! For more Picky Palate Cake recipes click HERE. 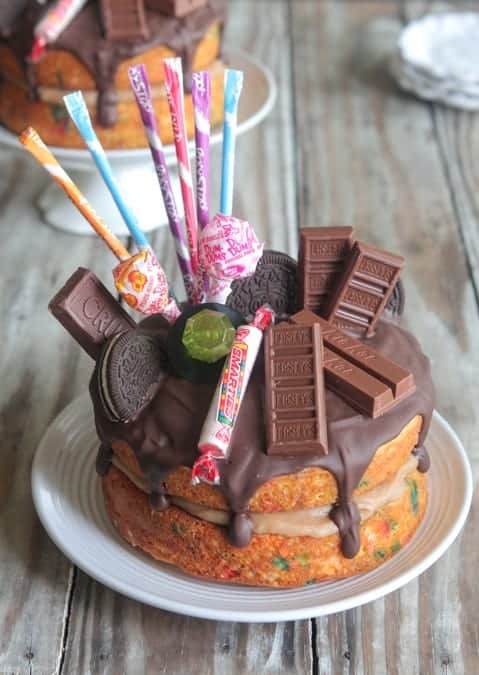 *Use the birthday boy/girl’s favorite candy to decorate the top of your cake. Personalize it to make it more special. *For any leftover cake, remove candy and place cake in an airtight container for up to 3 days room temperature or chilled. Preheat oven to 350 degrees F. and spray four 4-6-inch cake pans generously with cooking spray. Place cake mix, eggs, milk, oil, and sprinkles into a large mixing bowl. Stir until well combined then pour into prepared cake pans, spreading evenly. Bake for 25-35 minutes or until toothpick comes clean when placed in centers of cake. Remove and let cool completely. Place condensed milk and peanut butter into a small bowl, mixing until well combined. The four cakes will make 2 individual birthday cakes. Place 2 cakes onto separate serving plates. Spread peanut butter layer on top of each. Top with 2nd cooked cake. drizzle melted chocolate over each other cakes. Arrange how you'd like the candy bars, pixie sticks, suckers, ring pops and cookies. See photos for any help. Let chocolate set up and serve room temperature. Disclosure: England’s Best provided the eggs for this post. All thoughts and opinions are 100% my own. Thank you for supporting the brands that make Picky Palate possible. FOLLOW PICKY PALATE ON INSTAGRAM! Show me what recipes you're making from Picky Palate by using #pickypalate. 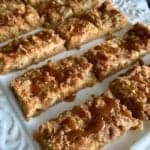 If You Like Starbuck’s Coffee Cake……. This is such a festive & FUN cake! 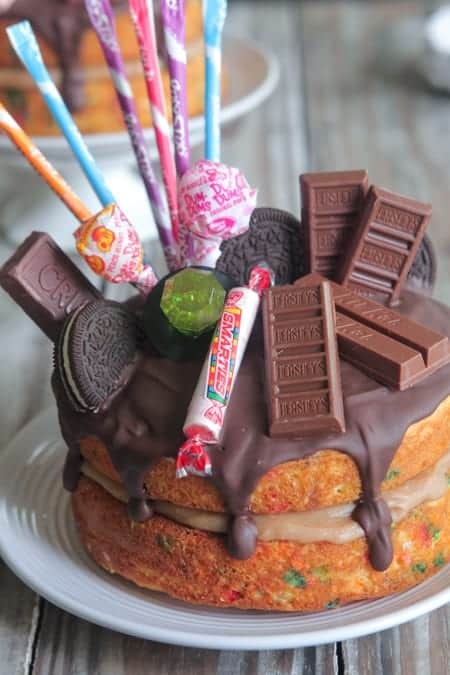 Whats not to love about this cake! What a cute cake! this would make any kid so excited! i dont think that i can make it like this anyway in my lifetime 🙁 it is saddening but i will do try all my best. thank you for teaching. I have NEVER seen such an appetizing cake! NEED to try! I need to try this ^^ Love this idea! Much more easier than drawing, or make the frosting smooth. 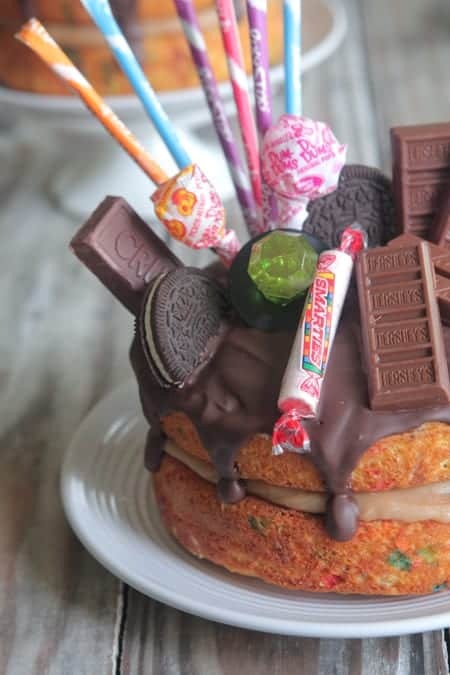 And the kids will definitely love this funfetti cake. Thank you for sharing this article with us! I believe there will be more people like me, they can find many interesting things in this article of you! Good article! We are linking to this great post on our site. Soon we will celebrate my daughter birthday and I need some cool example like these.Hope she like some presented by you, greetings. Welcome to Picky Palate, my online kitchen! You'll usually find me with a cookie in one hand and a salad in the other. It's all about the balance :) The recipes you'll see are my creations. The Picky Palate Cookbook is now available. Enjoy! Copyright © Picky Palate LLC 2007-2019. Please read Picky Palate Terms before using my work.